Steve Jenkins is a favorite with Cathy and me. His attention to detail in the overall design makes each of his thirty books very high quality. Also, his range of topics makes him very, very popular with readers. In his latest, The Animal Book, Jenkins looks at 300 of the world’s most remarkable animals that leap, soar, slither and tumble. The book is divided into eight chapters: ‘Animals’; ‘Family’; ‘Animal Senses’; ‘Predators’; ‘Defenses’; ‘Animal Extremes’; ‘Story of Life’; and ‘More Information’. 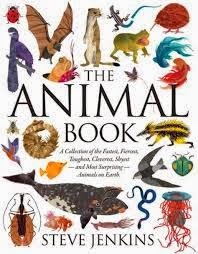 Within each chapter are two-page spreads that offer facts about some remarkable animal traits in this collection of the fastest, fiercest, toughest, cleverest, shyest -- and most surprising – animals on Earth. Every page is illustrated with the animals that correspond back to the topic. For example, in the chapter Defenses, under Protective Poison, there are eight animals that produce their own toxins. The weeverfish buries itself in the sand, popping out to grab smaller fish. Poisonous spines on its back protect it against its own predators. I learned that groundhogs live up to eight years. I’m trying to learn how to co-exist with the groundhogs that moved into my yard last summer. Fences do make good neighbors. One minor flaw states turkey vultures living 115 years. I believe it should have read 15. A wonderful addition to this compendium of animal facts, Jenkins writes about how he makes books, where he finds his inspiration, the research involved, and then what comes next once the idea for a book begins to take shape. You can also view this by going here. The Animal Book: a collection of the fastest, fiercest, toughest, cleverest, shyest -- and most surprising – animals on Earth is a top-notch science book that will appeal to a wide range of readers. For more information about Steve Jenkins, visit his website. this looks like a perfect book for kids who want to learn cool facts about lots of animals! And I love Jenkins' illustrations. thanks for sharing a review.